I’m terrible at them. So of course I sign up for them. Alright, for real though. Dewey’s 24 Hour Read-a-thon for you fine folks is exactly what it sounds like. A period of 24 hours in which you read till your eyes bleed and the Lady of the Pages finally takes your soul into the great beyond as much as you can. It’s a casual Read-a-thon (I’m getting really tired of typing that, I’m going to call it a RAT from now on) that you can participate in even if you don’t have a blog/vlog/twitter, etc. Just sign up (click me!) and read. There are prizes and a hashtag for those cool kids who can keep up but it’s really an excuse to sit around in read all day. 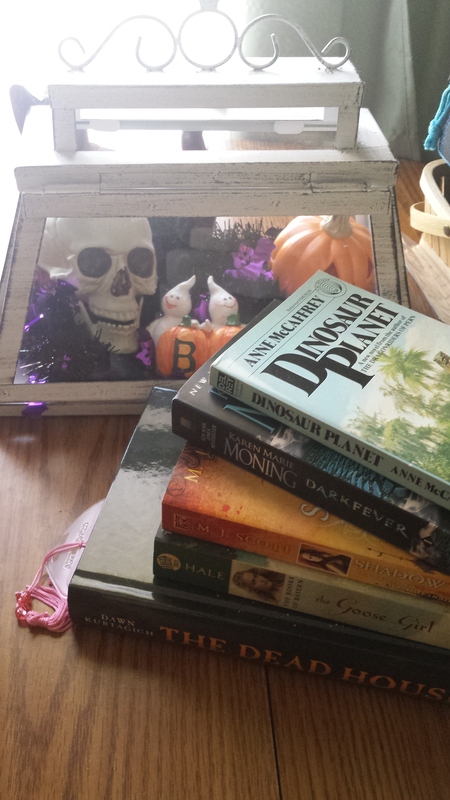 So here is where I make the TBR that I probably won’t stick to, but A for effort right?! The Dead House by Dawn Kurtaigch – By 8 AM Saturday I should be a good bit through this one, if not finished! DarkFever by Karen Marie Moning – One that’s been on my TBR for too long! I blaze through paranormal/urbans so this should be a fast one! Dinosaur Planet by Anne McCaffrey – This is one of the few Anne McCaffrey books I haven’t read, plus it’s tiny! Last if I feel like I just can’t take it with the adult fiction I’m going to try and reread Goose Girl by Shannon Hale, a fun fairy tale retelling book for middle grade. Throughout this whenever I break for Animal Crossing I’ll be listening to Dracula by Bram Stoker, the amazing audio version with a full cast. It’s sucked me in! So here’s to trying! I will give this Dewey’s a shot and maybe try and live-blog (is that a thing people do?) or do little check-ins on a master post tomorrow. We’ll see!